Would aliens, if they were to travel across incredible distances to get here, pass right by our lush coasts, our shining cities, our spectacular mountains, and settle in our most barren landscape? The answer is, Apparently So. Of course, barren is a relative term. If you’ve grown up anywhere along Washington’s western slopes, where it’s green in the dead of winter but you can still see snow on the peaks through the middle of summer, where horizon is mostly a concept useful for people who live in places without so much Douglas fir in the way, well, then barren is pretty much Medical Lake. Driving east from Seattle, you hold your breath for the 200 miles between Cle Elum and Spokane, waiting for trees to reappear. Halfway through, a Chamber of Commerce radio station declares, with no hint of irony, “There is always plenty of free parking in Ritzville.” And then, right at the end of this long stretch, after hours of dust devils and alfalfa and kids arguing and wheat fields and potatoes and more arguing, right at the transition back into trees and hills and curves in the road, is Medical Lake. 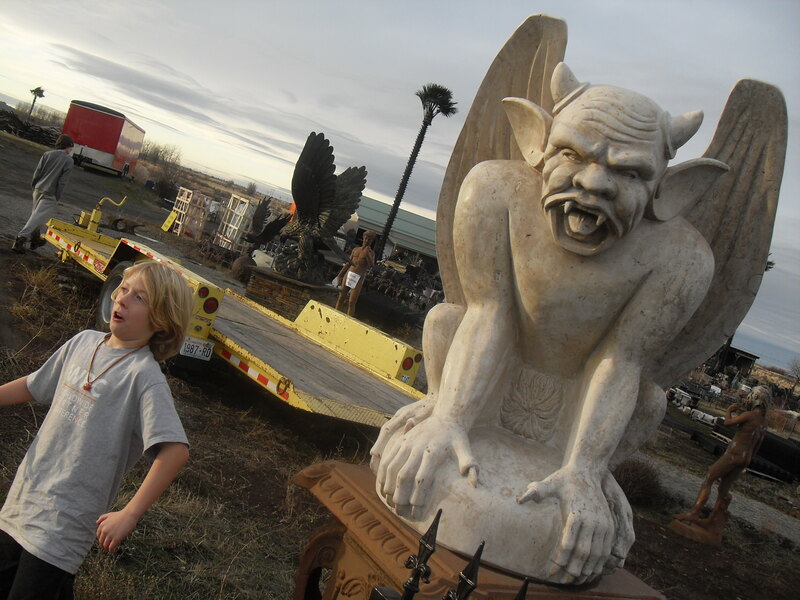 It’s here that two brothers from California—following a stint in Wyoming—purchased 21 acres of land along I-90 about five years ago and began filling half of it with bizarre metal and concrete sculptures, most of them manufactured in Asia. You’ll find flocks of dark menacing eagles, statues of naked men with joking signs over their privates, gargoyles, roosters, even the skulls of Texan longhorns tossed into a bin for sale. But no one comes here for the skulls. And not many come for the naked men. They come instead to see the UFO and its crop of aliens. The UFO and a seemingly friendly alien are easily visible from I-90. If you take the time to stop by, you’ll find more aliens and even alien-inspired chairs, all on sale. The truth is, our visit had nothing to do with geocaching. 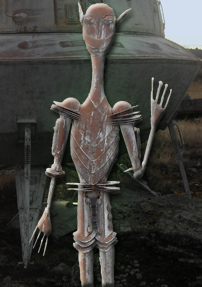 Traveling along I-90 in recent years, we had seen the UFO and were beckoned by an alien waving to us from the fenceline. And now, as winter approached, the aliens themselves were on sale for half price at $75. Very hard to resist. 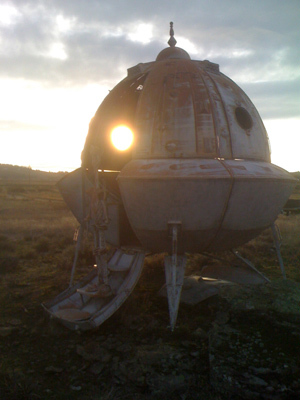 We sat in the UFO, looked around at the myriad sculptures, and talked to the owner about his love of this barren land. This land that grows basalt instead of crops. After years in California and Wyoming, he was home. When I asked what the business, this place, was called, he said simply, “The Farm.” The barren stretch from Cle Elum to Spokane was, to him, the best of all landscapes. And I think that if he were to travel east, he would hold his breath from Couer d’Alene to Missoula, suffocating under the relentless trees and mountains and waiting for the horizon to come back. When Peter P. joined the Windows 7 team as a user experience designer, he was given an opportunity most designers can only dream about. There are more than 1 billion PCs in use today, over 90% of them running Windows. If you are looking to change the way people interact with the products in their lives, this is heady stuff. There are so many places in Windows 7 for a UX designer to make an impact, from the touchscreen experience to the new ribbons in Paint. But as Peter explained to me at a recent tweetup, users have made one thing very clear: Don’t mess with Notepad. Turns out, people value the lowly text editing program not for its features, but for its lack of features. The top use of Notepad, especially among developers, is to strip out formatting. The last thing a Notepad user wants to see is change in the name of improvement. This is not simply a case of leaving well enough alone. When we watch how people really use products before determining the next feature set and put aside preconceived notions of how a product is supposed to be used, we develop better products. The same principle that has preserved the simplicity of Notepad for nearly 25 years led to significant enhancements to Excel early on when it was discovered that people used their number crunching software to organize text. This is why the very word processing features that have been kept out of Notepad all these years have been added, release after release, to Excel. If we look around us with an eye to how products are “misused” today, we can get a sense of where things are going. My son Nick doesn’t have an iPod, so he downloads music onto his digital camera. Considering the storage capacity of his camera, and the mediocre quality of the camera on my iPhone, I think he may be onto something. Two weeks ago, our verrückten German friends took care of the chickens while we were away in Montana for Thanksgiving. Before long we got a link to a Facebook page with a picture of Forrest riding a skateboard. I’m pretty sure a pair of 8-year-old girls put Forrest up to it, but it is pretty interesting. I’m not saying that chickens are the next big thing in children’s entertainment, or that sports are the next big thing in chicken entertainment. But just in case, I’m keeping a lookout for skateboarding chickens. How’s this for frontier life? 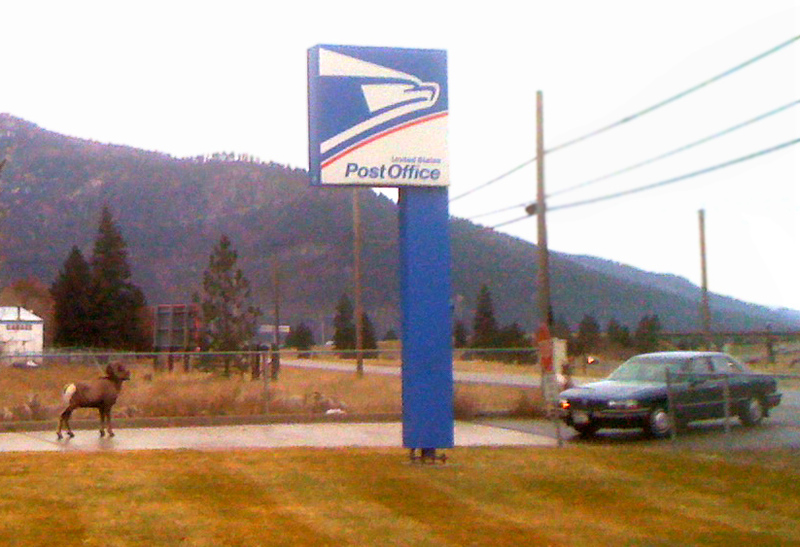 Just east of Missoula on Sunday, we saw 22 bighorn sheep blocking the entrance to a post office. There were other out-of-staters like me stopping to gawk, but then a woman from Montana drove up and nudged her car forward until 21 of them had scattered and one lone ram remained. The rest of us watched, holding camera phones in the air from a distance, as the woman drove around the ram, mailed her letter, and then drove back around him and headed straight off to her next errand. And I thought, is it more quintessential Montana to see 22 bighorn sheep standing around the post office, or to see a woman who treats them as a mundane nuisance?